GEORGE VI, KING OF THE UNITED KINGDOM. (1895-1952). 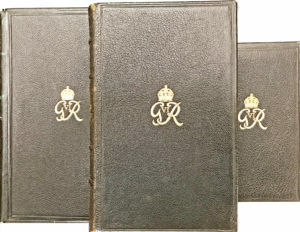 Rare presentation set (unsigned) of three volumes comprising the Holy Bible, The Book of Common Prayer, and Hymns Ancient and Modern uniformly bound in black morocco, bearing George VI’s gold embossed royal cypher on the covers, and gold embossing on the spine’s titles, black leather pastedowns, paper edges and dentelles. The bible and prayer book were printed by Eyre and Spottiswoode, (no date) and the hymnal printed by William Clowes, 1916. 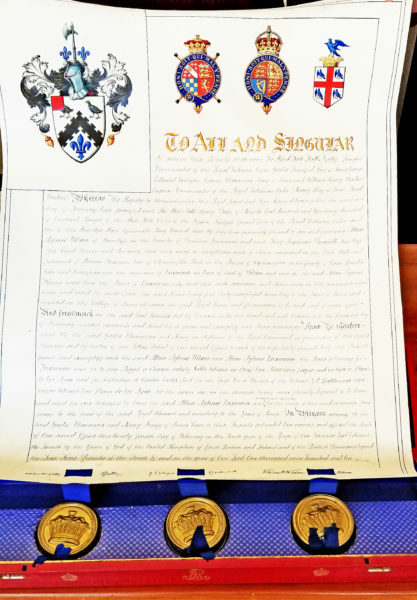 Provenance: Stanley Williams, former Superintendent of Buckingham Palace. Born Albert Frederick Arthur George during the reign of his grandmother, Queen Victoria, and third in line to the throne, “Bertie” developed a reserved personality, troublesome speech impediment and a deep spirituality. Taking the regnal name George VI, he succeeded his elder brother, King Edward VIII, whose scandalous relationship with Wallis Warfield Simpson, a twice-divorced American woman, led to his abdication in December 1936 after serving less than a year. “After the abdication crisis of 1936, [George] replaced his flashy elder brother Edward VIII and determined to re-establish the monarchy as the paradigm of decorum, reliability and reassuring staidness that it had been during his father’s reign,” (“George V: The Unexpected King and George VI: The Dutiful King,” The Guardian, Davenport-Hines). George VI took his private faith and public responsibilities very seriously, helping to transition the British Empire into a Commonwealth of Nations and redefining the monarchy for the 20th century, while drawing on his religious faith to show great leadership during World War II. 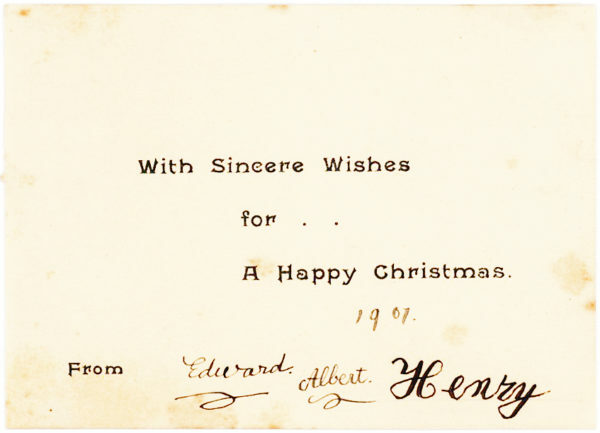 “As ‘Defender of the faith’, in his speech of September 3, 1939 at the outbreak of war, he was able to tell his people quite sincerely that we ‘reverently commit our cause to God’ and that ‘with God’s help we shall prevail’, concluding ‘May He bless and keep us all.’ In an equally memorable speech of December 25 1939, quoting the poem by Minnie Louise Haskins, he concluded with the words: ‘May that Almighty hand guide and uphold us all,’” (“George VI, or ‘Bertie’, upheld a tradition of Christian kingship that may die out with Prince Charles,” Catholic Herald, Phillips). 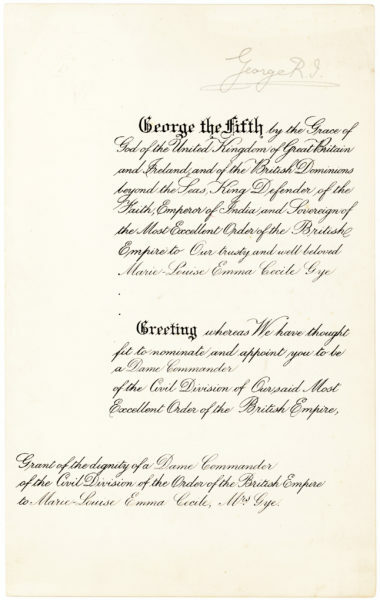 In 1939, a new testament distributed to British Forces bore a printed preface written by the king which read, “To all serving in my forces by sea or land, or in the air, and indeed, to all my people engaged in the defence of the Realm, I commend the reading of this book. For centuries the Bible has been a wholesome and strengthening influence in our national life, and it behooves us in these momentous days to turn with renewed faith to this Divine source of comfort and inspiration.” Throughout his lifetime King George VI donated special bibles to churches, libraries and universities. As king, George VI was the Supreme Governor of the Church of England, formed when King Henry VIII broke from the Catholic Church over, among other things, the right to read and print a bible in English. Our copy of the King James Bible, also called the Authorized Edition, became a defining force in shaping English language and culture. “Only in England was the Bible in any sense a ‘national possession’ … Englishmen carried their Bibles with them—as the rock and foundation of their lives—overseas … Beyond the shores of Albion [Britain], it fortified the spirit of the pioneers of New England, helped to shape the American psyche, and through its impact on thought and culture eventually spread the world over,” (Wide as the Waters, Bobrick). The Book of Common Prayer, first published during the reign of Edward VI in 1549, contains the liturgy of the Anglican Communion. 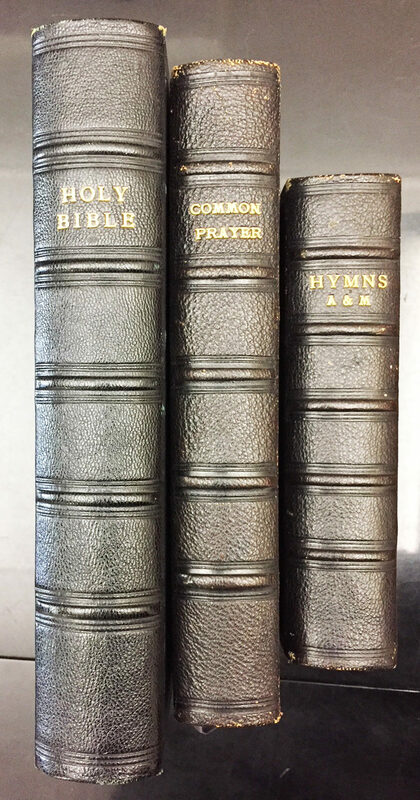 Hymns Ancient and Modern was first published in 1861, under the direction of the Oxford Movement, which sought to provide a standard hymnal that also included works from other religious traditions such as Greek, Latin and German. The hymnal was a popular success, selling 170 million copies over the course of 150 years. The former owner of this matched set, Stanley Williams, succeeded his father as Superintendent of Buckingham Palace, after having served in that position for more than 40 years. The younger Williams was an expert on the palace’s art collection and furniture and was a personal friend to the royal family. Tears on the first two pages of the bible have been professionally restored. Very minor wear to the edges of all three covers and near fine. 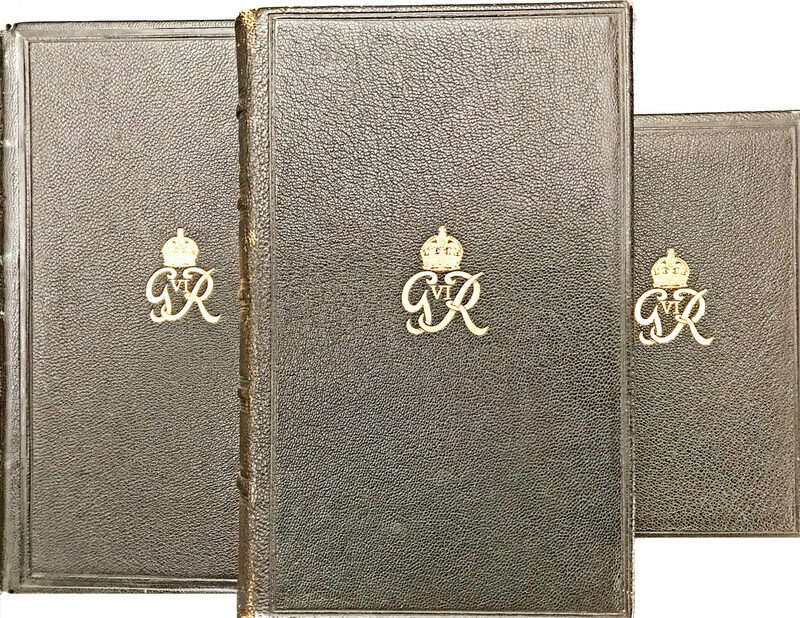 A rare complete set of three sumptuously bound books all central to the Anglican faith, gifted by the head of the church, King George VI.